Easter Eggs & Ripped Abs?! Whaaat?! Here it comes! Another fun holiday and we here at Fitness Retreat know everyone loves to use as an excuse to binge. Everyone has that urge so don’t feel so bad. Besides, we got your back! Eggs are an old staple of Easter and what better way to start your Easter Sunday than with a delicious breakfast of eggs, greens, and fruit! Chef Andie will walk you through all the steps needed to make this delicious meal. She’ll show you exactly what you need to do to make your Easter eggs the perfect and healthy way. Check the ingredients you will be needing below! And don’t forget to check out more of Chef Andie’s recipes on our website. Got everything you need?! To get cookin’ CLICK BELOW! 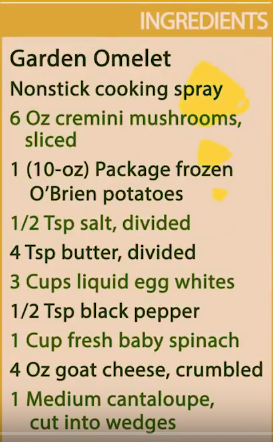 This recipe is part of a giant vault of videos that we have at Fitness Retreat, and recipes given to you when you complete our program. It’s just a taste of the kind of nutritional training you receive at our fitness retreats . We provide a multitude of classes with the sole purpose of preparing you for home so you can KEEP THE WEIGHT OFF FOR GOOD! Check out our AMAZING DEAL and join us at our beautiful newest location in Los Angeles! http://fitnessretreat.com/wp-content/uploads/2017/02/FitnessRetreatLogo_Revised-289x300.png 0 0 themepunch http://fitnessretreat.com/wp-content/uploads/2017/02/FitnessRetreatLogo_Revised-289x300.png themepunch2017-04-14 22:07:332017-04-14 22:07:33Easter Eggs & Ripped Abs?! Whaaat?! People who are looking to lose weight tend to be focused on cosmetic reasons. Looking thin will build your confidence and help you fit into that little black dress you see tantalizing you at the mall. However, there are a number of health benefits that come with losing weight as well and, conversely, there is a host of diseases that are caused by or made more likely because of obesity. Plus, it’s a difference you can feel. When you start to lose weight it’s likely that you’ll have more energy and feel generally better. Heart attack, or when oxygen-rich blood is blocked from entering a part of the heart. Oxygen isn’t restored quickly, that part of the heart begins to die. This can happen when a build-up of waxy plaque causes pressure that breaks the artery wall. When clot forms, it can partially or totally block off the artery which deprives oxygen to that part of the heart. Angina, which is when plaque narrows the coronary arteries and reduces blood flow to the heart. Resulting angina is a pain in the heart that signals a potential heart disease issue. Heart failure can also be a result of obesity. This is when the heart isn’t able to pump enough blood to the rest of the body. Heart disease is one of the deadlier complications that come with obesity. While it can take a long time to build up a dangerous amount of plaque, heart complications can often happen without warning. Strokes take the fourth spot on the top causes of death for Americans. A stroke occurs when oxygen-rich blood is unable to properly flow into the brain, causing brains cells in the affected area to die. There are two types of stroke: ischemic and hemorrhagic. Ischemic strokes occur when the artery that supplies the brain with blood is blocked and hemorrhagic is when the artery ruptures and leaks. Again, obesity leads to a buildup of plaque which causes these blockages and your risk of having a stroke rises with your body mass index. Obesity is a big factor in increasing your risk of type-2 diabetes. Diabetes is when the blood glucose (blood sugar) levels are too high. Normally the body produces a hormone called insulin which converts glucose into energy but with an overabundance of glucose, the body can’t produce enough insulin to manage your blood sugar. Diabetes can cause death, stroke, kidney disease, and blindness. While these aren’t the only medical complications that can come with obesity, they are among the most serious. Since your BMI is often directly related to your risk of getting these diseases, fat loss can immediately lower your chances. With every pound you lose, you can begin to lower your risk factors. Tips to Making Healthy Decisions When Dining Out! BE SMART WHEN EATING OUT! Don’t skip meals earlier in the day to “save up” for the evening. It’s way too easy to overeat when you’re hungry. Look for key words on the menu: “roasted”, “grilled”, “poached”, “steamed”. These terms usually mean they were prepared without extra fat or a large amount of calories. It is still always helpful to ask your server exactly how the food is prepared. Don’t be afraid to make substitutions. On that same note, stay away from items that are “fried”, “smothered”, “sautéed”, “covered”, etc. Obviously, these are less healthy items that can easily have twice the calories of the steamed versions. Enjoy the dining experience. Take your time, eat slowly, and enjoy the social side of eating. It takes about 20 minutes for the brain to register that you’re full. We consume a lot less calories when we eat slower. It is also easier on the digestive system. Remember to choose a blend of carbohydrates, proteins, and fats at each meal. One large bowl of pasta with cream sauce is not the best way to go. Add chicken and veggies, switch to a red sauce, scale back the amount of pasta and you’ve got a great meal. Ask for dressings and sauces to be put on the side. That way, you can decide how much to use. Remember, a little goes a long way! Take home at least half of your meal. Most restaurant portions are enough for 3 meals so there’s no need to clean that plate! It is even advised that you get the takeout box when the food arrives and put half of your meal in right away. Portion control is the single most important thing to practice in a restaurant. It will save you more calories than you know. Let’s say you dine out about once a week. Allow yourself one “exciting item” whether it be a glass of wine, soda, or small piece of cake. Remembering moderation is always key to avoid overindulgence later. On average, Americans eat over 200 meals away from home each year. Remember these tips when dining out. By making small changes over time, you can enjoy restaurant food without sacrificing good nutrition. http://fitnessretreat.com/wp-content/uploads/2017/02/FitnessRetreatLogo_Revised-289x300.png 0 0 themepunch http://fitnessretreat.com/wp-content/uploads/2017/02/FitnessRetreatLogo_Revised-289x300.png themepunch2017-02-03 08:31:442017-02-03 08:35:00Tips to Making Healthy Decisions When Dining Out! THE IMPORTANCE OF PIZZA IN WEIGHT LOSS! After years of working at our Fitness Camp, it’s hard to say we haven’t heard it all. Pizza is very important to most people, rightfully so. It’s a delicious sinful little treat that we need to have. This is one of the many scenario’s that happens often too many times… It’s Friday afternoon, you are leaving your office after a long hard week, and you are looking forward to a much needed break. As you begin your drive home, you are thinking about being home, relaxing, and maybe even rewarding yourself for all of the hard work you have done. Maybe it even occurs to you that you are feeling as if you have earned it. Surely everyone deserves a reward every now and then you think. As this thought crosses your mind, you pass by a Pizza Hut, that seems to be calling your name. With your eyes fixated on the big red and white sign, you car appears to be steering itself into the driveway. Before you realize it, you have devoured several slices of the delicious deep-dish pizza, and as a feeling of guilt washes over you, it occurs to you that this does not feel like a reward. That is what a lot of pizza lovers struggle with, this is why we are here to help. As with most rewards, the tendency to go overboard with pizza, or any food for that matter is ever present. While we have all used food either consciously, or unconsciously as a reward at some point, we have all probably also abused it as well. As you can see from the example given above, without a conscious awareness of what we are doing, this tendency becomes magnified. Much of the reason for this is due to the fact that when we are not aware of what we are doing, we are at a loss to change it. As you can see from above, the reality of our actions does not occur to us until after we have already done them. Clearly, at that point it is much to late. It is usually then that we feel overwhelmed with guilt. The difference between using something, food or anything else as a reward, and abusing it, is being consciously aware of what we are doing. With this awareness, we are armed with the power of choice about what we do. This of course, enables us to evaluate our decisions, negotiate for what we want, and leave the situation feeling satisfied. This sense of choice applies to everything we do, and in the area of weight loss, becomes invaluable. Applying a sense of choice to foods, we are able to evaluate every decision we make, weighing the impact of what we want to eat, against where we want to be. If we want to eat a hot fudge sundae, yet we want to fit into that pairs of pants currently collecting dust in our closet, we are going to have to make some serious choices. The reason this choice becomes so important is that without evaluating it clearly, one of two things will inevitably happen: we will either avoid the sundae, telling ourself we can never have it, feel deprived, and end up overdoing it later, or we will avoid thinking anything, and just have it anyway, without thinking about it, and end up overdoing it, and feeling guilty. Avoiding both of these negative situations then becomes dependent on our ability to think clearly through the decision making process. Obviously, we can neither avoid the sundae totally, or have all of it right now, as neither one of these choices satisfies both of our wants, ands goals. So, we are going to have to be able to negotiate with ourselves for both these wants and goals, and look for a third option. When it comes to pizza, third options come in many slices, pardon the pun. We can either have less of the dangerous deep-dish version, reducing the total caloric impact of it, or we can come up with a healthier version. That is just what California Fresh and Fit has done. Offering tasty, yet surprisingly healthy versions of the foods we love is what this company specializes in. Imagine pizza that is fresh! http://fitnessretreat.com/wp-content/uploads/2017/02/FitnessRetreatLogo_Revised-289x300.png 0 0 themepunch http://fitnessretreat.com/wp-content/uploads/2017/02/FitnessRetreatLogo_Revised-289x300.png themepunch2017-02-03 08:27:342017-02-03 08:33:49THE IMPORTANCE OF PIZZA IN WEIGHT LOSS!